If you want to really suprise somebody and make their 21st birthday just that extra bit special then why not visit Bizzy Balloons. 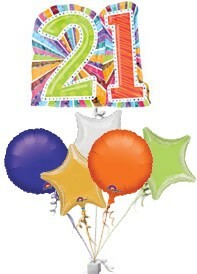 They offer a 21st birthday balloons delivery service ranging from £23 to £42. This includes a free box of chocolates for the recipient with every order. When you have added your selection to your basket, you also have the ability to add some further related gifts to be delivered such as 21st birthday mugs, cards and cakes.